“Want to join us?” That was the question in late November last year (this day takes place early in Dec.) which started my involvement in a project that warmed my heart. Amy (Amylouwhosews) and Rachel (PS I Quilt) brainstormed the idea of making a quilt for Kim (My Go-Go Life) because her son had just deployed and because she needed one and because she was making him one of the same pattern (only in blues and white) and because we all understood deployments and because, well, we love her. Her son deployed. Rachel and Amy brainstormed the quilt and invited me for the ride. We are all (including Kim) military spouses who have had loved ones deploy, we understand deployment but can’t quite fathom it from the mom’s perspective. We figured the knee jerk instinct to protect and keep one’s child out of harm’s way must be conflicting with the rational understanding that her boy was an adult and well trained. Using the Look to the Stars pattern out of Rachel’s newly released book “Quilts Made with Love” (which is, of course a fabulous pattern and book! ), we all pieced the quilt using scraps from our stash. Once we got it together, I quilted it with a whimsical star and loop pattern. It was pieced and quilted using Auriful. The batting was Pellon's Nature's Touch 50/50 Bamboo/Cotton blend. First time using it and I loved it. Like quilting with butter. From Pellon's blog, "Bamboo Blend Batting has a soft, silky hand and some naturally anti-microbial properties. It is durable, breathable, and comfortable. This regenerated cellulosic fiber has microscopic pores that allow for excellent wicking which draws moisture away from the body. It is an excellent warm weather option. Bamboo’s inherent properties also make it a natural selection for those who suffer from allergies." As we built this quilt, Rachel and her hubby Shane, who are in OH, planned a trip to VA for the day we intended to give this to Kim. You see, we used the guise of a sewing day at my house and Kim was set to come but then her kids had half days at school and that killed that plan. Meanwhile, Rachel was scheduled to arrive and we had no contingency plan. Amy was talking regularly to Kim but Rachel and I were staying mum so as not to draw suspicion. Amy kept trying to figure out a way we could see Kim on that Friday and eventually, when trying to get Kim to make arrangements, had to just stop trying to make arrangements to avoid further suspicion. Thursday night Rachel arrived and we sat down to finish binding the quilt while Amy worked on the label. My pups, seeing a quilt so close at hand tried like crazy to lay on it. One made it as far as her nose on Rachel’s leg. I think this had more to do with Rachel’s appreciation for having the pup nearby it than the pup’s perseverance, however. The next morning, plans commenced. We piled into the car, in the pouring rain and swung over to pick up Amy. At this point, we thought all we would be able to do is see Kim for about an hour, if we were lucky, at a local Starbuck’s or something. It was clear she didn’t want folks just “showing up” at her house. It was one of those weeks for her and we were trying to be considerate. That failed. I called her and told her Amy and I were nearby, could she break and meet us. (Remember, Rachel’s presence was still an unknown to her.) She checked her calendar and just had to decline to clear up some work items. With our silent apologies to her and her employer (ahem, Alex Veronelli, Auriful – we thank you for your understanding), we just drove to her house and let Rachel go knock on the door. And we wait. And wait. Are we too late? Did she leave to go get her kids already? It’s pouring rain. Rachel calls, while at the door. Phew! A moment later, out comes Kim. LOVED the look of happy surprise on her face! She greeted everyone and then off to the back of the van to see our other surprise (Rachel was the first one). Of course, the whole thing was rushed, she had to get her kids but once she realized Rachel was here (we didn’t tell her about the third surprise later, we didn’t want her to feel guilty if she decided to stay home) and that Amy planned to grab her kids from school and come hang at my place with Rachel, Shane and I, Kim decided to do the same and joined us later that afternoon. Uh, duh. –sigh- Suave, I am not so let’s pretend it makes me cute and move on, shall we? We all settled back in, gabbed more, ate, gabbed, played a little in my sewing room. Kim has a thing about trying every kind of sewing machine she can and really, who can resist playing on a mid-arm once it is in front of them and the owner has it set up for play time? Not anyone, that’s who! Finally, the night came to an end, people departed and bed time called. It was such a good day, planned and prepped for or not, I love having people visit, but ultimately, the day was made great by the love we were able to share with one special person. I hope that this fine lady, who would never hesitate to assist another living soul, one I’m blessed to call a friend, now knows how much she means to those around her. Check out Kim's and Rachel's take on this wonderful experience. Wonderful story - wonderful friendship! 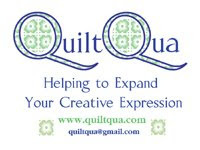 Amazing story and I love making friendship quilts, especially the surprise kind. I don't usually get to deliver them though. I too love bamboo batting and use it on really special quilts.